Zach Roberts is an actor, director, producer, and composer living and working in Washington, DC. Zach grew up shouting Simon and Garfunkle off key in the back seat of his parent's mini van, not understanding the contextual oddness of a three year old singing "making love in the afternoon with Cecilia up in my bedroom." From there he moved on to not understanding the context of singing Italian opera in the childrens choir of many operas with Opera International in Washington, DC. Eventually, as he made his way to high school, he understood the value of both understanding the words he was singing and the virtue of singing on key. At McLean High School, Zach became the president of the McLean Madrigals, then ranked as the 7th best high school choral department in the country. 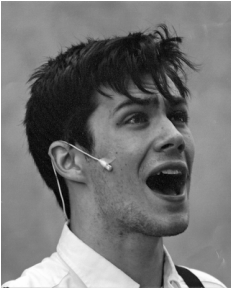 After graduating high school Zach impulsively moved to London to study opera at Trinity College of Music. While living in London Zach worked as a freelance operatic and classical singer, singing with numerous choral societies, musical groups, and opera companies in the United Kingdom and in Europe. In 2010 Zach moved back to Washington DC and began a transition into the world of theatre. He began taking acting classes at The Studio Theatre Acting Conservatory in 2011, and started working as an after school high school theatre director in 2013. On New Years Eve in 2012 Zach was suddenly struck by inspiration and was compelled to write a musical, which turned into the song cycle His & Hers. A profoundly untrained but incredibly enthusiastic pianist and composer, Zach loves to accompany singers on slow torch songs. In 2015 Zach made his TV debut playing Billy Foy in the American Heroes Channel program American Titans. Zach is the proud artistic director of DC Music Theatre Workshop, a group he founded in 2015.